Hardly a day goes by without news of sectarian violence between Sunni and Shia Muslims. In both Iraq and Syria, extremist Sunni ISIS forces have been fighting governments which are predominantly Shia. In Pakistan, sectarian attacks are now so common that they hardly make the news any more; and in the UK, the two communities have become polarized as a result of these international tensions. Yet, even though the division between the two main branches of Islam is nearly as old as the faith itself, most people know little about how it began, or how different the beliefs and practices of both groups are today. 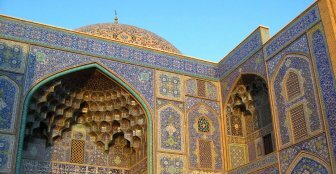 In this programme, Kristine Pommert seeks a Shia perspective on these questions from Sheikh Mohammed al-Hilli, a Shia researcher and lecturer. Born in Baghdad, he has lived in Iran and the UK and is a strong advocate of Shia-Sunni understanding. He explains how the two groups went their separate ways over the succession to the Prophet Muhammad, and why the particular reverence Shias have for the family of the Prophet (known as the Ahlulbayt) means that they understand some aspects of Islamic law and practice differently. Listen to the counterpart to this podcast, The Great Divide: A Sunni Perspective, featuring Cambridge scholar Tim Winter, here. At the death of the prophet (peace be upon him), the companions found themselves facing the question of where to bury the prophet’s body. There were two opinions: either to bury him in his mosque or to bury him with his companions in the Baqi`. Every prophet who died, was buried in the exact spot where he died. Actually, the prophet (peace be upon him) died in `Aisha’s room, so he was buried there. Obviously, the room was not big enough to hold all his companions. Thus, only the needed number, among the members of his family, carried out the burial procedure. Such details, along with others, were what the editor meant by logistic reasons for the delay, stated in many sources and discussed earlier in my previous answer. Holy Prophet (pbuh) clearly announced Hazrat ALI a.s, not once but several times in his life,as the one to be followed after him(pbuh) .But on the occasion of Saqifah after Prophet had left this land, a group of selfish and greedy people denied the instructions of Holy Prophet that was the time when separation within muslims begun. Still Muslims can gather on one page if all sunnis realize and embrace this fact. It is a mistake to contend that the Prophet (pbuh) did not leave instructions regarding succession. He clearly did, naming Imam Ali as his successor before a huge crowd, only some important people chose to deny it. It is a mistake to contend that the so called Caliphate was established through popular consent; far from it. As a matter of fact the first three Caliphs were each chosen by three different methods; only Imam Ali was chosen by popular demand. As for the tragedy of Karbala, its seeds were, indeed, sown at the inception of the first Caliphate. Yazid, to whom reigns of power were transferred by his father, cannot even be counted a Muslim. Yet he professed to be the head of the then Muslim state, forcing all Muslims to swear to his allegiance or, else, face elimination. Forced, Imam Hussain refused to submit to this demand. To stage an uprising was not his mission.